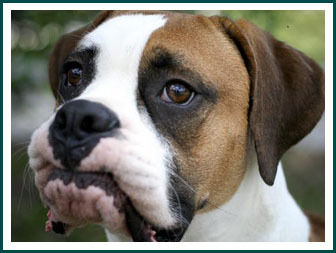 They come to us, these beloved Boxers, with all sorts of problems. It is a rare event when we bring one into the program that does not require help in some way. And we fix them all – it is just what we do and what we have always done. Some have broken bones and some have broken spirits. Too often, they have been neglected and abused and we restore them to health, both physically and mentally. We have many good hearted veterinarians and dog behaviorists and trainers who have partnered with us to care for our dogs and we are thankful for them every single day. But even with their generosity, it takes a tremendous amount of money to rehabilitate the number of dogs we have pouring into our program. We do ask adopters to pay an adoption fee, but those fees do not cover even half of our dog expenses, so we must rely on the generosity of our donors. Thanks to your generosity and desire to help Boxers in need, FBR has never had to close its doors to a dog who desperately needs help. We are only able to provide medical through your donations. Please meet the dogs who are currently in need of medical care. Click the link below if you wish to donate towards their care. There are currently no dogs in emergency care with FBR but we continue to have day to day vet expenses that are covered by your generous donations. Whether it is the result of neglect or outright abuse, we have dogs who have come to us with broken minds, broken spirits and broken trust. We enroll them in a program to address all these issues and find permanent loving homes that will continue the work to re-earn their trust, redirect their minds, and rebuild their spirits. You can also check out our Compassionate Care page and meet some of our dogs who are terminally ill or seniors. These dogs will remain with FBR and their foster family on a permanent basis. Your donations help keep these amazing dogs as healthy and comfortable as we possibly can. Please consider donating towards our Compassionate Care dogs. Click here to visit our Compassionate Care page. What’s the difference between an “ER Fundraiser” and a donation? When you send a donation, those funds are allocated to the care of all our program dogs and our minimal overhead expenses. Contributing to a dog’s ER Fundraiser goes to a specific dog of your choice. They may be in need of long-term care or immediate medical attention. Every amount helps in making a better life for these loving canines. Click here to visit our donation page and learn all the ways that you can give.